Would you like to learn more about the true scope of Helping Women Period? This story is beautifully displayed in our 2018 Impact Report. We would like to thank MoonSail North for their incredible collaboration and execution. Please click on the thumbnail to enjoy! 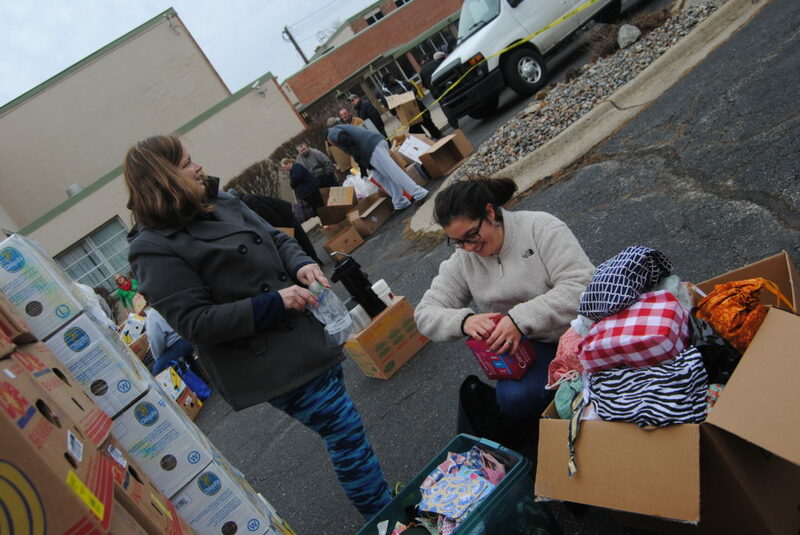 Thank you to all our volunteers who supported the 12 distributions held throughout the city of Lansing this past year. 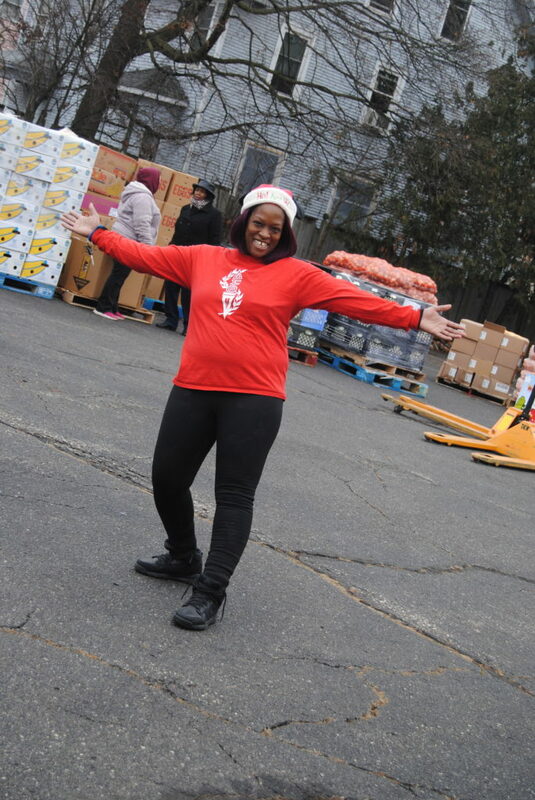 In rain, snow, or sun, you showed up and distributed with a smile. 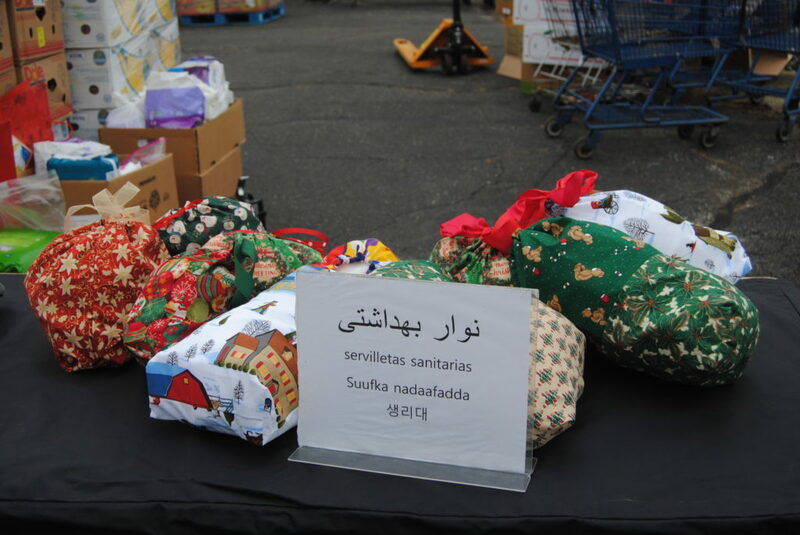 Below are some recent photos from the December distribution (scroll to see all of them). 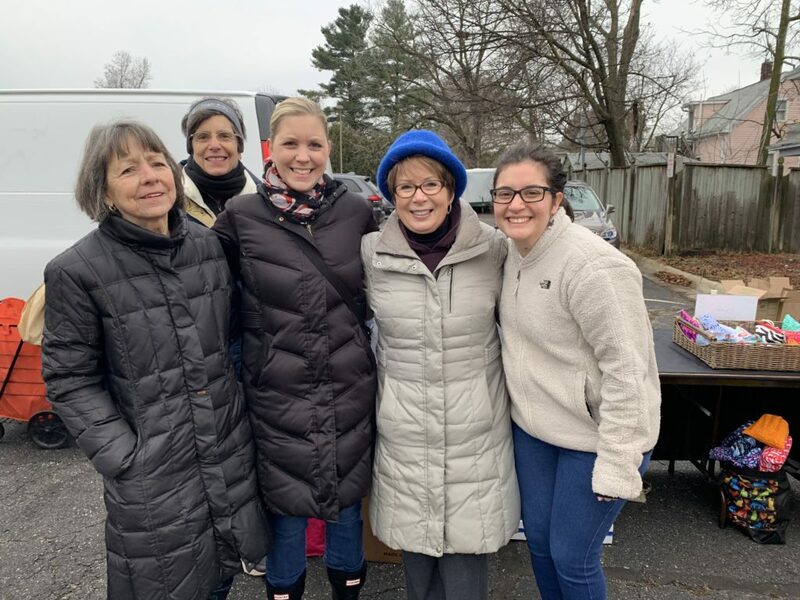 We could not support this monthly commitment without our long-standing volunteers and the new folks who show up as well. We not only distribute the products, but carry boxes of food as well. Most importantly, we meet wonderful people who are very grateful for our services! 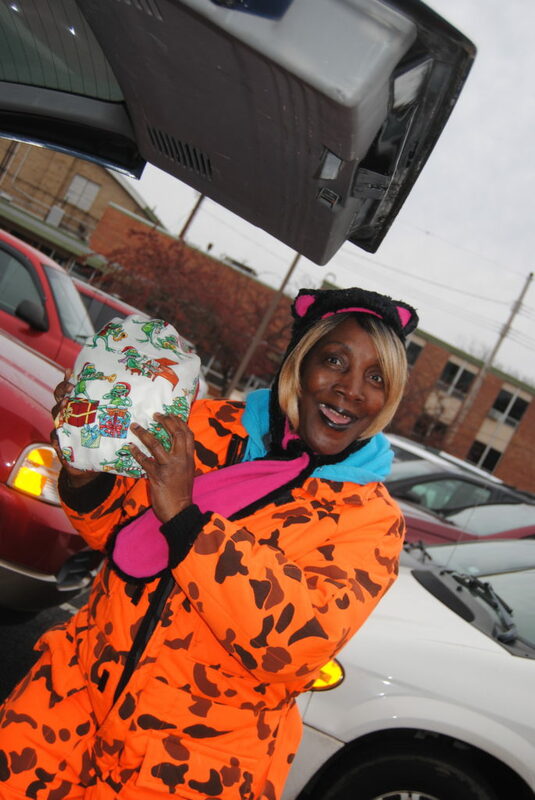 This fun lady was all to eager to “model” with our holiday bags. One of our mighty volunteers hauling boxes. Amy and Faith, the TV reporter from the City of Lansing. Nikki Johnson, the mastermind behind the entire day! 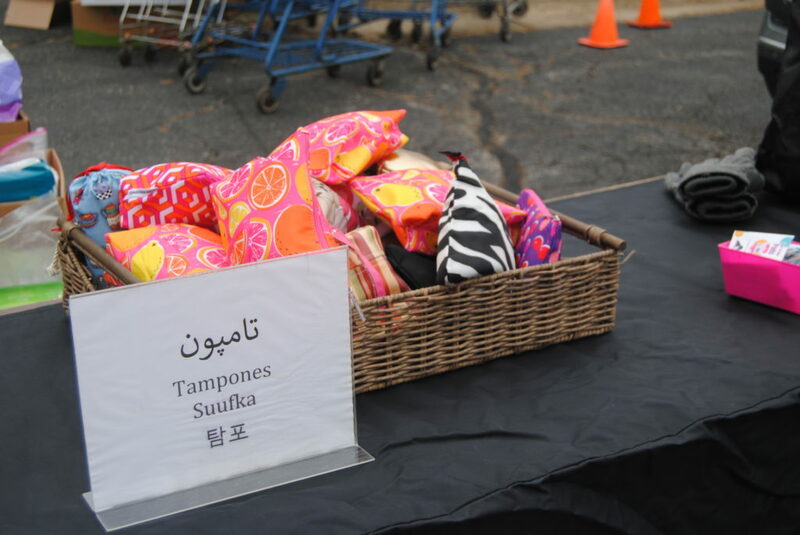 Fun tampon bags-they were a hit. How Can I Do This In My Area? 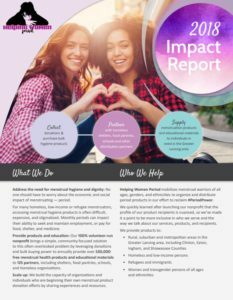 We aim to reduce menstrual stigma and increase access to the product throughout the country (and the world), not just here in mid-Michigan. 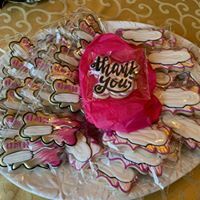 On a weekly basis, we receive inquiries from folks around the country who are interested in recreating what we do here at Helping Women Period. However, our bandwidth is limited. If you or someone you know is interested in making a difference in their community, please view this great video to get started. Then, feel free to reach out with any additional questions! On December 3, we held a Volunteer Appreciation Brunch. 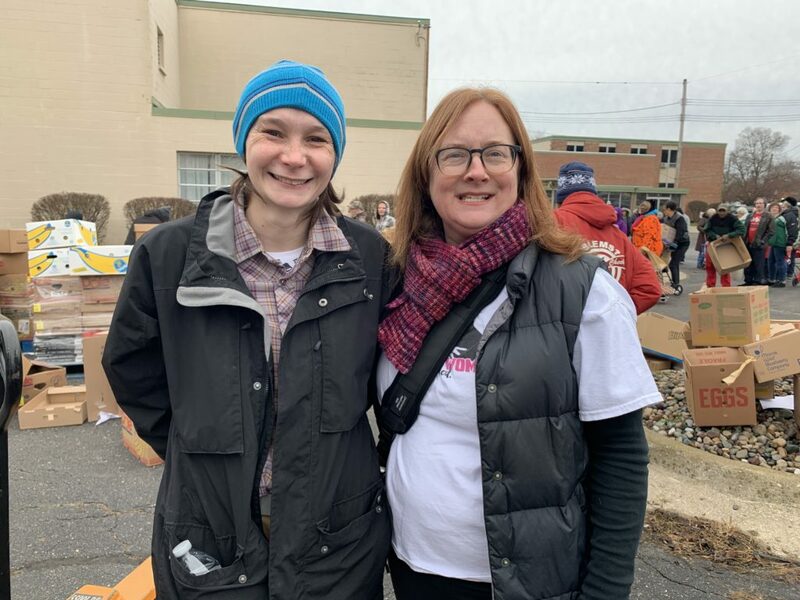 It was a time for us to take a few moments to express our appreciation for the many roles our volunteers fill in order to make HWP run smoothly. It was also a time for the volunteers to meet and greet each other. We are thankful and humbled by all you do to support us. If you were not able to join us, we want to make sure you know you are appreciated. To all of our volunteers: We could not do this without you! Chivon Kloepfer of WLNS met with Lysne and Amy to learn more about the need for menstrual products in the community . View Chivon’s report below. Do you recall what it was like to be 15 and start your period at school (or 12 for that matter)? Raising your hand in class, walking down the hallway, and totally forgetting what you were just learning? HWP has launched its annual #GivingTuesday campaign, focused on raising funds to install 15 free vending machines in area schools. Thus, “15 for 15”. Please consider donating what works for your budget, starting at $35.00. The link is below. 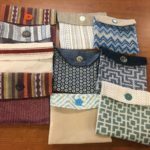 For every $300 raised, we can purchase the dispenser and a semester worth of product. Follow our Facebook page to see your donations at work as they are installed throughout 2019. Winners of Caring About Women Locally Award! 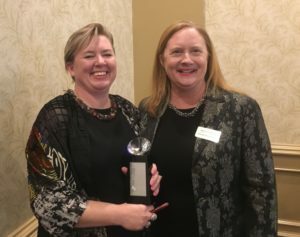 Amy Stephenson and Lysne Tait, co-founders of Helping Women Period, received the “Caring About Women Locally” award at the Inspiration and Influence Awards ceremony on October 18, 2018. These awards are presented by Capital Area Women’s LifeStyle Magazine (CAWLM) and the Aitch Foundation to celebrate women in the mid-Michigan area and to recognize women who are inspiring, impacting and influencing change in our community. 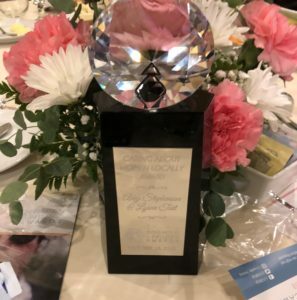 The first Inspiration and Influence Awards ceremony has identified some remarkable women leaders with distinguished awards in the areas of community impact, women’s advancement, medical research and awarded the mid-Michigan Woman of the Year. The Greater Lansing region is full of innovative women who are positively impacting our lives within the community. Winners were selected by a panel of Michigan-based judges from the Greater Lansing community. Look for them and other winners in the upcoming edition of CAWLM. 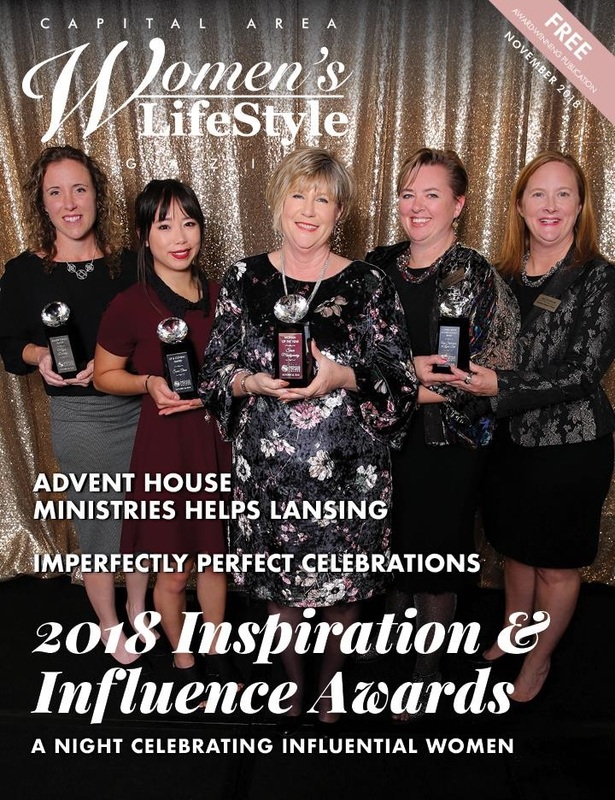 CAWLM is Lansing’s premier monthly women’s magazine intended to feature local women, businesses, nonprofits, events and more. The Aitch Foundation is dedicated to changing lives through the advancement of cancer research while generating community involvement through sports and fashion related events. The Aitch Foundation has a mission to raise awareness of and generate charitable contributions for research into early detection of hidden cancers. 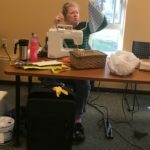 Sew Much More! 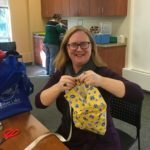 is a group of sewers and non-sewers that gather to construct bags that are filled with menstrual products by Helping Women Period (HWP) and distributed to those in need. The group generally meets one a month at Okemos Community Church. Everyone is welcome — no prior experience is necessary. In October, Amy Stephenson, Co-Founder of HWP visited the group to say “Thank you” for their efforts. Sew Much More! 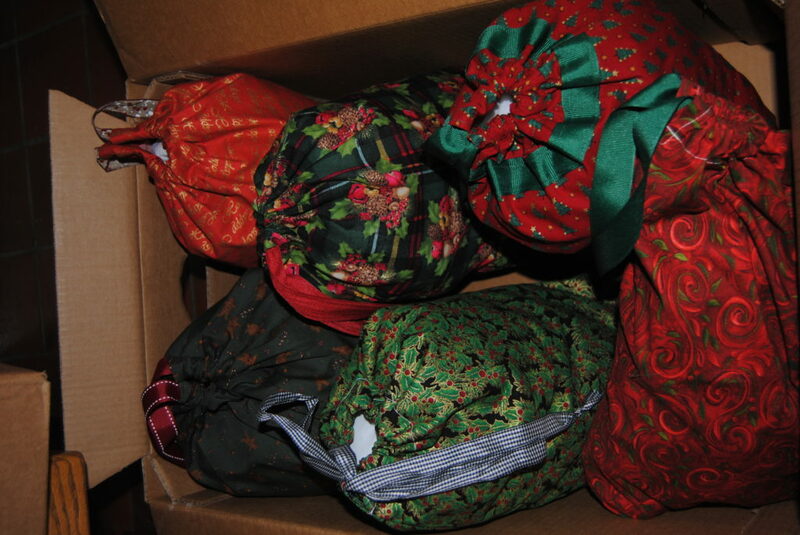 presented Amy with 75 bags that day. From its inception in September, 2017, the group has donated 545 bags. If you are interested in joining this group, please contact Okemos Community Church at Volunteer@Okemos OCC.org. 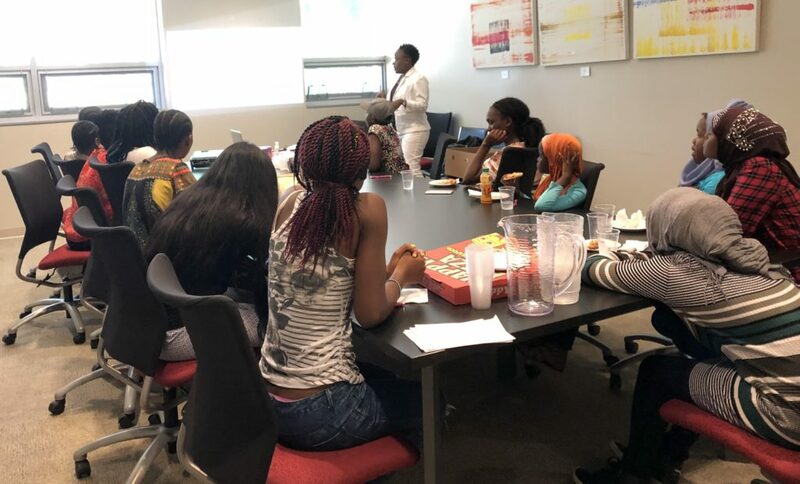 On Friday, July 13, HWP co-director Lysne Tait and Be A Rose founder Christine Mwangi conducted a menstrual health workshop for 13 teenage participants at the Refugee Development Center in Lansing. The workshop was filled with lively conversation and excellent questions. Also, each participant received a month supply of product. The workshop was such a success, they have been asked back by the participants. Future topics include the construction of cloth pads as part of the on-going sewing circle held at the center. We would like to thank Ms. Erika Brown-Binion (and the rest of the staff) for welcoming us! 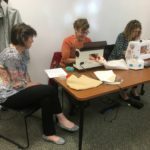 Also, this workshop would not be possible without the generous support of the City of Lansing and the Zonta Club of East Lansing. Many studies have been conducted assessing the important role of education in addition to the distribution of pads to girls. There are also organizations all around the word just beginning this important educational work as well. 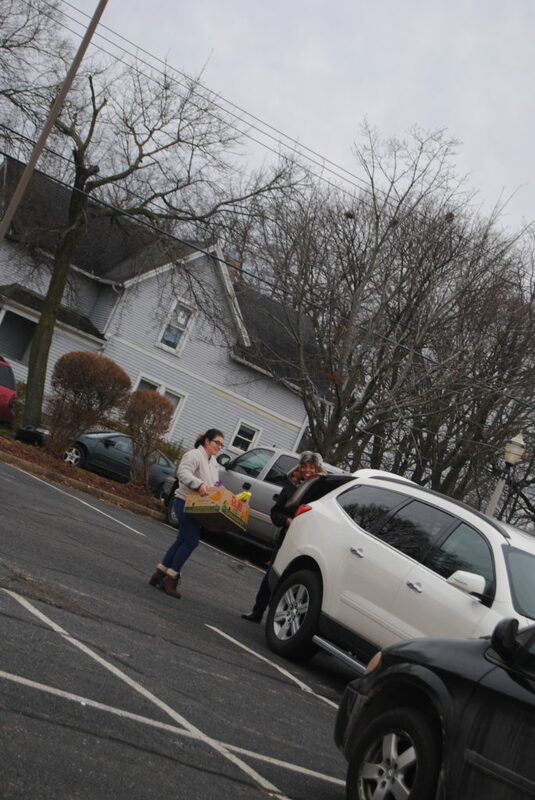 Right here in Lansing, HWP is committed to coupling product distribution with education not only through these workshops but also by distributing pamphlets (currently in Spanish and English with more languages to follow) at many of our distribution events. If you are interested in assisting us, see the exciting events below! 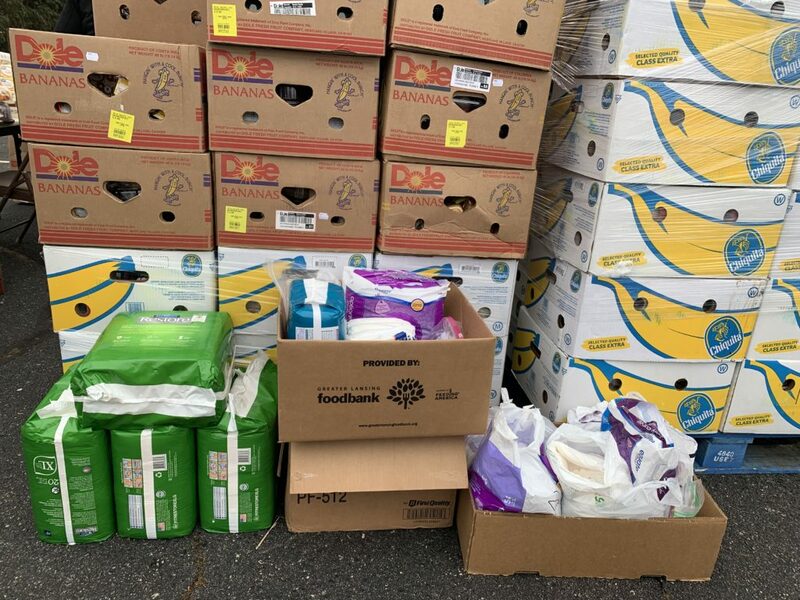 August Mobile Food Pantry – we have a canopy to protect you from the sun!